How does the book of Daniel fit into the Bible and into history? The above chart provides a quick overview of what the Old Testament of the Bible is about. To understand the book of Daniel, it is helpful to understand how it fits into the Bible. Following is an explanation of the chart. At the bottom of the chart is a time line extending from Creation until about 100 AD. The top of the chart outlines 10 periods of Old Testament history. Above these 10 periods, the chart also shows the Old Testament books which pertain to that period of history. The top of the chart is read from left to right and top to bottom. For example the first period is the Pre-Abrahamic period, the second period is the Patriachal period, the third period is the Egypt and the Exodus period, and so forth. The chart also shows where the books of the Bible fit into the periods of history. 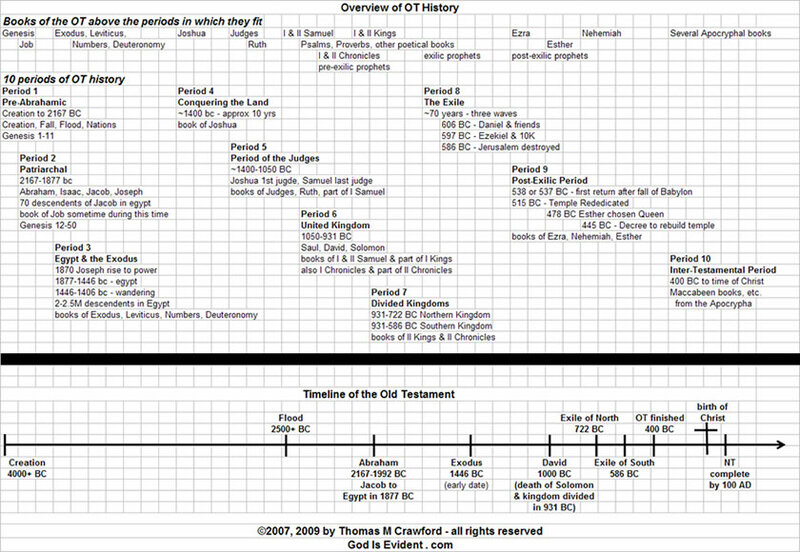 Please follow the chart as I outline some of the major events in the Old Testament. We do not know exactly when creation took place, as there may be a gap between Genesis 1:1 and Genesis 1:2. The way we currently understand the laws of Physics including the Theory of General Relativity, we are certain that the universe (time, space, and matter) had a beginning and has not always existed. The book of Genesis reveals that God created the universe “In the beginning…” This is also the beginning of the period I have labeled the Pre-Abrahamic period of Old Testament History. The offspring of Israel (Jacob) spent more than 400 years in Egypt, and became slaves to the Egyptians probably toward the end of this period of time. The book of Exodus takes up Israel’s history near the end of this 400 year period. Thus begins the third period of Old Testament history, Egypt and the Exodus. Four books of the Bible – Exodus, Leviticus, Numbers, and Deuteronomy – cover this period of time lasting about 40 years. During this period of time, God used Moses to liberate the Israelites from slavery in Egypt. Also during this time, God gives Moses the Ten Commandments and other laws for the Nation of Israel. After God gives the Ten Commandments and the other laws, Moses sends twelve spies into Canaan. When they return, ten of the spies give a bad report which scares the Israelites, they complain to Moses and to God, and they refuse to enter the Promised Land. God punishes Israel by making the continue living in the desert for about 40 years. The Egypt and the Exodus period begins about 1446 BC and lasts for 40 years. After the 40 years of living and wandering in the desert, the next period begins. This period, Conquering the Land, covers about 10 years where Israel conquers the land of Canaan in the area of the world now known as Israel and Palestine. The people of Canaan were evil. They sacrificed their own kids to a god named Molech by burning them alive. This gruesome act is one of the reasons that God ordered Israel to conquer the land of Canaan; it was judgment for human sacrifice. The book of Joshua covers this period of Old Testament history. Israel conquered Canaan beginning around 1406 BC. The next period is that of the Judges. The books of Judges, Ruth, and part of 1 Samuel cover this period of time. It lasted up until about 1050 BC. There are two periods or phases next. The first is the period of the United Kingdom. During this time beginning about 1050 BC, Three kings rule over Israel – King Saul, King David, and King Solomon (David’s son). Upon the death of Solomon in 931 BC, the kingdom divides into the Northern Kingdom of Israel, and the Southern Kingdom of Judah. We call this next period the Divided Kingdom period. During this latter period, a number of evil kings rule Israel and a mixed number of evil and good kings rule Judah. The books of 1 Samuel, 2 Samuel, 1 Kings, and 2 Kings cover these periods of time. 1 Chronicles and 2 Chronicles which were written at a later date also cover these periods of time. The poetical books (Psalms, Proverbs, and others) were written mostly by David and Solomon, but also had other authors. Also during these periods, several prophetic books called the pre-exilic prophetical books were written to warn both Israel and Judah of their coming judgment if they refused to turn back to God. The Northern Kingdom of Israel was finally conquered by Assyria in 722 BC as warned by God through the prophet Isaiah. The Southern Kingdom of Judah lasted until around 600 BC when it was conquered in three phases by the Kingdom of Babylon. This begins the period called the Exile. The first phase of the exile began about 605 BC when Daniel and many of the nobility in Judah were exiled to Babylon by King Nebuchadnezzar. The second phase occurred in 597 BC when Ezekiel and 10,000 Jews were exiled to Babylon. And the third phase occurred in 586 BC when Nebuchadnezzar attacked again destroying Jerusalem and the temple in Jerusalem. The conquering of the Kingdom of Judah is written about in the books of 2 Kings, 2 Chronicles, and some of the prophetical books. The Exilic prophets cover the period of the exile – which lasted about 70 years. One note – ever since the Northern Kingdom of Israel and the Southern Kingdom of Judah were exiled in 722 BC and 586 BC respectively, descendents of Israel and Judah have been dispersed all over the earth. This is why we find Jews on all the continents and in various countries around the world. This event is called the Diaspora. Only recently have more Jews begun to live in Israel than have been scattered around the world. I think I heard recently, that within the last few years, finally there were more Jews living in Israel than in the United States. Possibly the Diaspora is ending. It should also be noted that we are not exactly sure what happened to the people from the Northern Kingdom of Israel, though there are theories and some evidence about different people groups being related to the “ten lost tribes of Israel.” The term Jew comes from the name Judah – so Jews in general are descendents of the Southern Nation of Judah, consisting mainly of three of Israel’s tribes, Judah, Benjamin, and Levi. The next period of Old Testament history is the Post-Exilic period. After approximately 70 years in Babylon, a group of Jews was allowed to return to the land of Israel, and rebuild both the temple and the city of Jerusalem. The books of Ezra, Nehemiah, and Esther as well as the post-exilic prophets cover this period of history. It concludes about 400 BC. The final period of Old Testament history is the Inter-Testamental period. During this period of time, no Scripture was written so technically it is post-Old Testament history. It is sometimes called the 400 Silent Years. This is a period of time after the rebuilding of Jerusalem and the temple after the exile, and leading up to the birth of Christ at about 4 BC. It is also the period of time when the Maccabeen books from the Apocrypha were written. During this time an evil dictator named Antiochus Epiphanes killed many of the Jews and desecrated their temple by setting an idol in the temple and offering a pig as a sacrifice. (You will run into him again in your study of Daniel since Daniel predicted him.) The Maccabeen revolt occurred against Antiochus Epiphanes, from which the Jews get their celebration of Hanukkah. Finally this leads up to the birth, life, death, and resurrection of Christ. Christ was born about 4 BC and died sometime around 30 AD. Right after Christ’s death and resurrection, the Church Age began, and has continued up until now. The entire New Testament was written and completed before about 100 AD. How does the book of Daniel fit into Old Testament history? The book of Daniel covers a period of time from about 605 BC, up until around 535 BC. It is the period of time called The Exile. Daniel was kidnapped and exiled to Babylon (in present day Iraq) in about 605 BC when he was about 15 years old. He served King Nebuchadnezzar and 2 other kings in Babylon. He also served King Darius, the Medo-Persian ruler. Daniel’s book prophesies in detail about the period of time between when he lived up through the time of Christ. He prophesies when Jesus the Messiah or Christ was to come. And he gives detailed prophecies about still future events leading up to the end of the world. During the time of the Exodus, right before Moses’ death and right before Israel conquered the land of Canaan, God warned Israel through Moses the consequences of disobedience to God’s Law. Read Deuteronomy 27:1 thru 28:48. Summarize the warning and the promise that God gives Israel for respective disobedience and obedience to His Law. How does this passage strike you as you meditate on it? God warns them that disobedience to His Law, and in particular idolatry, will bring on the punishment that happened in the time of Daniel. This passage, written during the time of the Exodus, was written about 800 years before it was fulfilled! A partial restoration from the exile to Babylon happened a few years after the death of Daniel. Up until this day, there has not been a full restoration of Israel back to its land. We are however, some 3400 years after Moses’ prophecy, are seeing this restoration happening – fulfilled prophecy from 3400 years ago! In 1948 we saw the establishment of Israel as a nation, and we see a migration of Jews going back to Israel. Question to ponder. What is the probability that these two prophecies – the Diaspora and the Restoration – would occur 800 years and 3400 years after their respective predictions? Only God could make such a prediction! There is one more item of background on the book of Daniel that I would like to cover in this lesson. This has to do with the moral and spiritual conditions in Judah, for approximately the last 100 years of the Southern Kingdom of Judah, right before the period of the Exile. Read 2 Kings 21-25 and 2 Chronicles 33-36 (the last 4 chapters in each book). Summarize the kings of Judah given in these chapters, what were the deeds good or evil that they did, and what was their fate. These are the kings which ruled the Southern Kingdom of Judah for roughly the last 100 years before it fell to Nebuchadnezzar from Babylon. Manasseh was not only disobeying God’s Law, but he was whole-heartedly doing one of the things for which God destroyed the Canaanites when he allowed Israel to conquer them. Amon son of Manasseh. An evil king who reigned only two years. Notice that he conceived his son Josiah when he was about 15. Does this speak of immorality in the land. People did marry younger upon occasion, so I am not sure, but it is something to ponder. Jehoahaz son of Josiah. An evil king who reigned only three months. Put on the throne by Pharaoh Neco when Neco had killed Josiah. Eliakim son of Josiah. Renamed him Jehoiakim. He was another evil king who reigned eleven years. Jehoiakin son of Jehoiakim. Another evil king reigned eight years and was taken captive by King Nebuchadnezzar of Babylon. So what were conditions just before the exile like? They were like the conditions (idolatry, immorality, child sacrifice, etc.) that God had warned them not to get involved in 800 years earlier under Moses. They were doing the same things for which God had destroyed the Canaanites through the conquering Israelites! God had warned them of exile, now in the last chapters of the book of 2 Kings and in the book of Daniel, He was keeping His promise! Question for thought. How do the conditions of Judah before the Exile compare with the conditions of your country or in the world today?